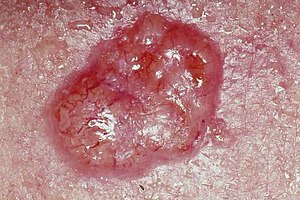 A basal-cell carcinoma. Note the pearly appearance an telangiectasia. Skin cancers are cancers that arise frae the skin. Thay are due tae the development o abnormal cells that have the ability tae invade or spread tae ither pairts o the body. This page wis last eeditit on 1 Mairch 2018, at 17:24.